If MailCheck is hidden, you can re-enable the display of the extension with a couple of clicks. 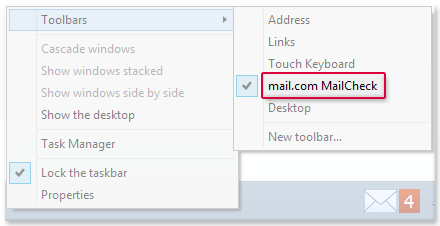 If you have accidentally hidden the task bar icon for mail.com MailCheck, you can re-enable the display. Click the task bar with the right mouse button. The task bar is at the lower edge of the screen. Move the mouse to the Toolbars entry. Click the mail.com MailCheck entry. The task bar icon is shown.